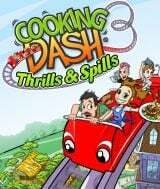 Download Cooking Dash - Thrills and Spills for free at FreeRide Games! 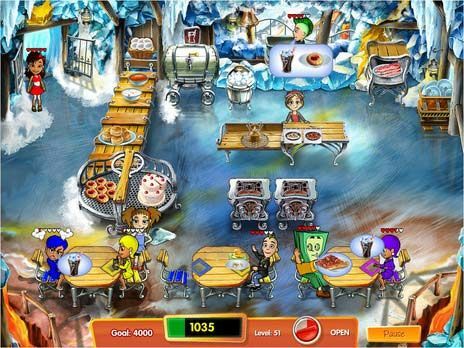 Prepare for a stroll down memory lane with Cooking Dash - Thrills and Spills. Meet Flo and the rest of the DinerToons as youthful DinerTeens, working their first summer job at Mr. Big's theme park restaurants. Can you keep Flo and her friends preppin', grillin' and sizzlin'? Find out in this thrilling Time Management game where you'll serve sit-down customers, bag up food for Dash-Thru window diners, and revamp every restaurant in the park. 50 fast-paced levels of play. Fun themed venues like the Log Jam, Spooky Shack, and Deep Dive. New Dash-Thru window service to keep you on your toes. Nostalgic DinerTeen flashbacks + 9 customer personality types.